The Irish government has formally launched the country's bid for a seat on the United Nations Security Council. U2 frontman Bono added his voice to Ireland's bid to secure a two-year term on the council in 2021. He said "compromise is a word that the Irish people understand very, very well". The band staged a concert for diplomats on Monday night. 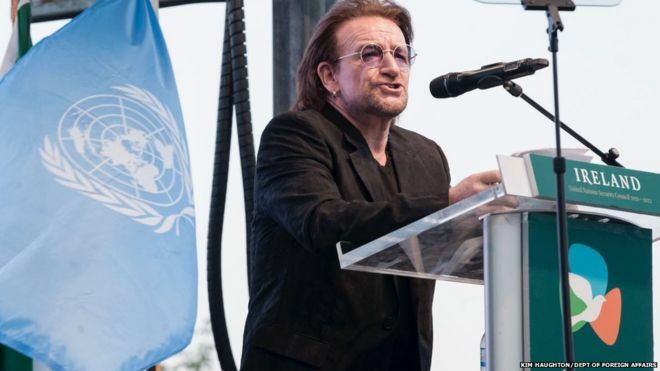 Bono warned that "we live in a time when institutions as vital to human progress as the United Nations are under attack". He said the UN needed "storytellers" because words mattered and one word mattered in particular. "The word is compromise because that's how you achieve peace and compromise is a word that the Irish people understand very, very well," he said. "It is part of our story, our recent story, and we are storytellers. "So you honourable peace activists, if you need some storytellers to describe what's really important about this place… let us tell the story." 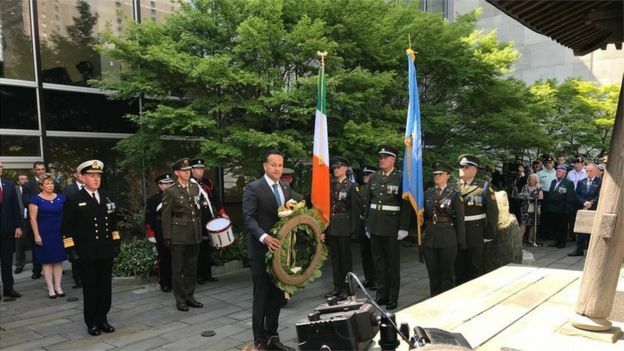 "Since the first Irish troops first were deployed on UN peacekeeping operations in 1958, not a single day has passed without Irish participation in UN peace support operations," he said . "Over the past sixty years, tens of thousands of Irish women and men have worn the blue helmets on UN peacekeeping operations. We are as proud of the blue helmet as we are of the harp or the shamrock. "Every village, town and neighbourhood in our small country has sent men and women to serve on United Nations peacekeeping missions. "Everyone knows someone who has served in the UN, if not several. Peacekeeping has become a part of our national identity.